As much as I was hoping to stay out of the ER Monday night, I wasn't so lucky. The hives crept onto my face, and I was forced to go into Beverly Hospital so that my reaction wouldn't get more serious. Thankfully they weren't too busy, and after a Benadryl injection and a dose of Prednizone, I was on my way home to bed. I'm still not sure what is causing the hives (although stress has been making them worse), but they seem to be slowly subsiding. I just hope they are gone completely by the end of the week and that they don't decide to pop up again. 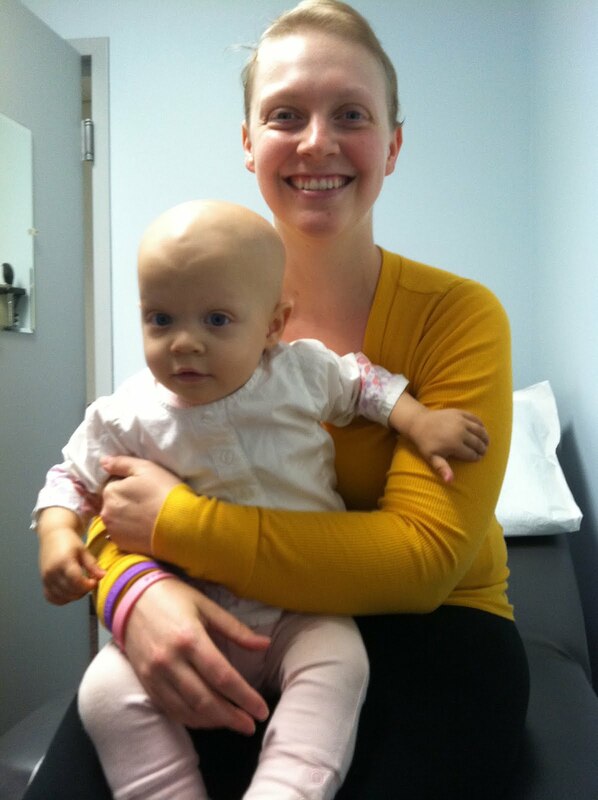 Adding to my stress, and my hives, is the fact that Saoirse is back at the hospital this week. Tuesday night she spiked a high fever, and we had to bring her into the ER. She got a dose of antibiotic and they did blood cultures, but because her counts were so low, we had to stay. It was good that we did, because her temperature spiked a couple more times. We also found out that she has a moderate case of mucusitis. This is the most uncomfortable I've seen her since before she was diagnosed. This is one thing that I never experienced, so I just feel horrible that I don't know how to better help her. I have heard that it feels like a sunburn in your throat - if that is truly accurate, I can't imagine how she is even able to eat anything. She is on morphine for the pain, and we just have to sit and wait for her counts to come up and her body to heal itself. Luckily, her counts have started to rise already, and we have seen a great improvement today. Although we don't have a perfect answer for the fevers (they could be from the mucusitis), they are starting to space farther and farther apart, and come down faster with the Tylenol. She had a nice long nap this morning, and then a much more playful afternoon, so we know she is starting to feel better. She is on a pain maintenance pump tonight, so hopefully she will get a good night's sleep, and feel even better tomorrow. With her counts on the rise, she should start healing herself, and hopefully we can come home soon. I just hate seeing her in pain. We have been so lucky so far with side effects not being too horrible, and this is just not fun for any of us, especially Saoirse. We will definitely be working with her doctors the next time she gets this chemo regimen to try and stave off the mucusitis by encouraging her white cell growth more right after chemo. I've been told this isn't usually done because of the higher likelihood of bone pain, but she has been on double "G" before, and the bone pain is much more easily managed, and she is much less miserable. I just can't see her going through this again if it can be avoided. I just hope the doctors will be one the same page. At lest we have a while before this regimen comes up again. Now, we just have to keep her comfortable, try and get her to eat some, and wait for her body to perform it's own magic. Thank goodness she won't remember this later. I am a mother of triplets, and my little use tracheostomy, I was with her six months in the ICU, but is in no way something so strong with you. I wish all the best for you and forgive my English is very bad. Big kiss and be with God. What I'd like to say is, in my family we have something more or less like your story... my cousin had linfoma, and some years before her mother and her grandma also had, well, all the 3 are health and great today! Sometimes God send us some messages we cannot understand, but you and your little baby are together on this for supporting each other and when everything get over, you'll be stronger together! Look for the Gerson Therapy, I study several months, is a correct therapy that works the body and mind, so tune into to achieve healing, it is less painful than the chemotherapy, it is also cheaper and assure very effective, works for many people. See http://www.youtube.com/watch?v=6InKJ8JVwOE watch the other chapters you will understand. Kisses and stay with God. saw your story in the news. Having just lost my son to Stupid Cancer in April, I feel you pain in some ways. Although I can't imagine how I would have done it if I had do battle the evil disease too. Praying for peace for all of you!